Millions of years ago, some of our mammalian ancestors made a bit of a bargain. To avoid being underfoot and potentially easy pickings for the dinosaurs that ruled the day in the Jurassic period, mammals starting living their lives at night when there would be fewer threats and less competition. 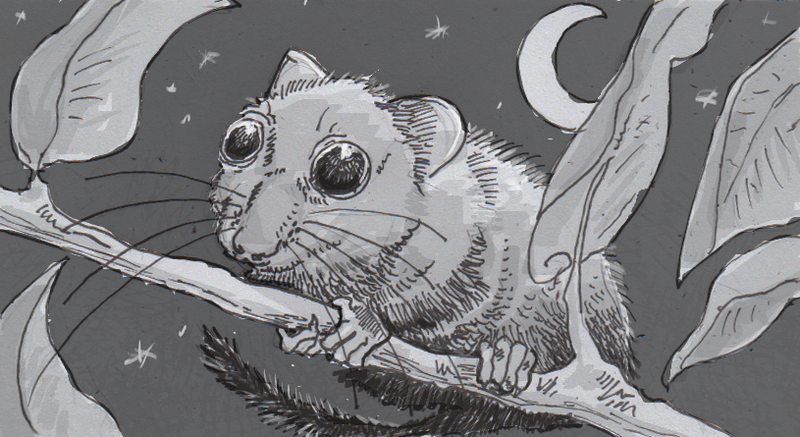 To get around in the dark, these mostly shrew-like creatures developed whiskers, better hearing, and crucially, night vision. That night vision came at a cost though, namely many of the cells that would have otherwise been used for daytime color perception. Researchers have now isolated the genetic mechanisms that forced this trade-off, and they suspect it was very much worth the cost of color. The retina of your eye is composed of two types of cells, classified as rods or cones. The cones allow for color perception, with specific sets of cells for red, green and blue in many primates, but only green and blue in most mammals. The rod cells are specialized for differences in brightness, and can detect as little as a single photon against darkness. In most fish, birds and reptiles, there are more cones than rods, but our nocturnal ancestors set mammals up with an inverted arrangement— the majority of a mammal’s retinal cells are cones, allowing for much better visual perception in low light. There are exceptions, of course, with nocturnal owls having developed more rod-heavy eyes, and primates like humans swinging the other direction, possibly regaining the ability to see red as a way to deal with snakes. The mechanism behind this cone-to-rod trade has been found a protein called Nrl. When a mammal embryo is developing, it generally starts with more primitive features and then refines them, such as how humans temporarily develop gill-like slits and tails before growing into our more modern form. Mammal eyes start with a more ancient template as well, growing retinas mostly populated by cone cells. The Nrl protein then binds to the embryo’s DNA, rewiring cones to instead develop as rod cells. If Nrl is blocked, experimental mice were found to lack rod cells entirely. Looking at the genes surrounding Nrl production, it appears that this arrangement started a long time ago, and has been barely touched since mammals first became nocturnal. This indicates that this low-light trade-off has been very successful for mammals, and thus very few species have had sufficient pressure to reverse it (aside from the aforementioned primates.) It was also noted that this cone-to-rod conversion isn’t how other groups of animals develop cones. Animals like zebrafish seem to have developed their relatively small number of rod cells in a different way, unrelated to the mammalian “solution” to seeing at night. In addition to better color vision, it seems like mammals may have also given up some cellular regeneration. Fish are able to regenerate damaged retinas better than mammals, suggesting that Nrl conversions may inhibit healing in some way. Researchers are hoping that when they better understand how all these pieces fit together, we may eventually improve treatments for our own eyes.